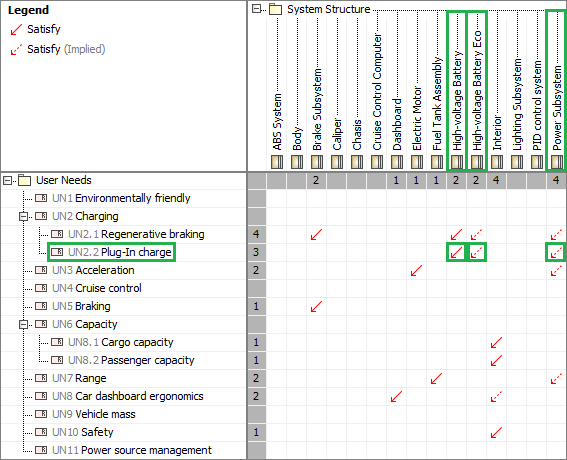 The Dependency Matrix is an ideal tool for efficient analysis of dependencies between elements. In some cases, dependencies between particular elements can cause indirect relations with other model elements. Let’s take a look at the following image. 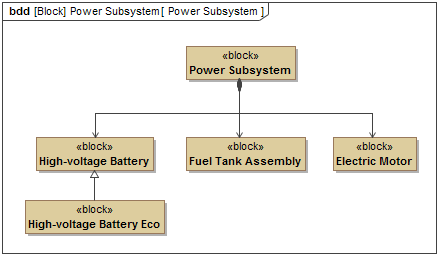 In this example above, composition and inheritance structures between blocks are displayed. If a composite part depends on a particular element, the whole element also depends on this element. The same situation exists with inheritance between blocks. Inherited elements indirectly depend on the elements to which a parent element has relations. Beginning with MagicDraw version 18.3, indirect relations (we call them implied relations), can be displayed on the dependency matrix. Take a look at the following image. In the preceding example, the High-voltage Battery block satisfies the Plug-In charge requirement. According to the composition and generalization, Power SubSystem and High-voltage Battery Eco blocks should satisfy this requirement as well. These relationships are shown as implied and marked with red dashed arrows. In this case, the Category 1 of Ultra Low Emission Vehicle requirement is derived from the Environmentally friendly requirement, which is refined by Provide electric engine power and Provide power from electric and gasoline engines activities. 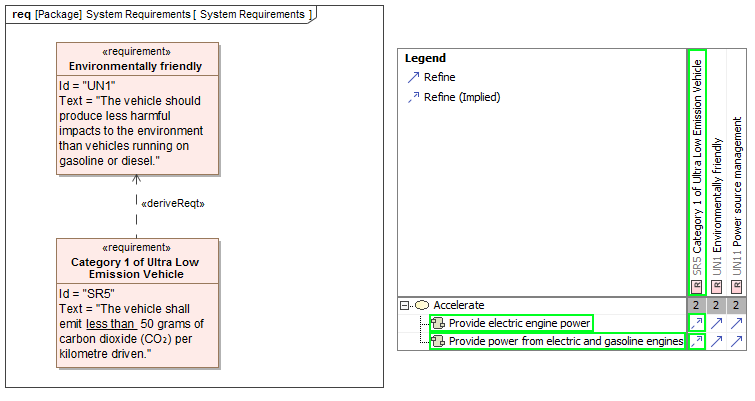 According to this, implied refine relationships between activities and derived requirement are displayed. Implied relationships can also be used in Relation Maps, Generic Tables, Smart Packages, and Derived Properties.